How to send from an email address alias? 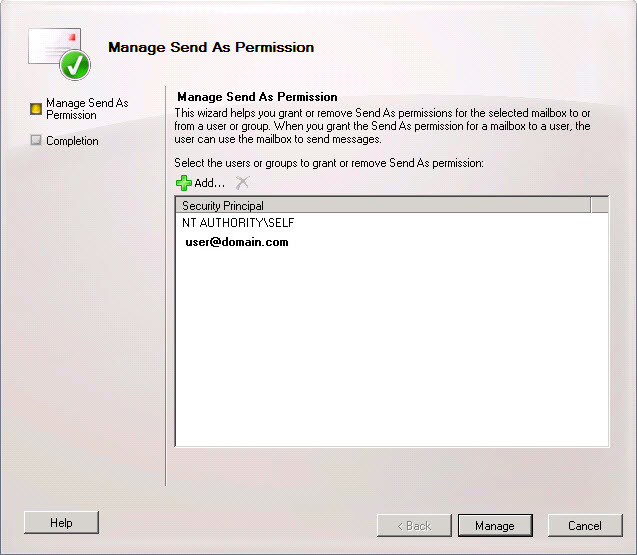 Create a separate mailbox and put the alias on the mailbox and configure it with send as permissions. Create a distribution group and put the alias on the distribution group and configure it with send as permissions. 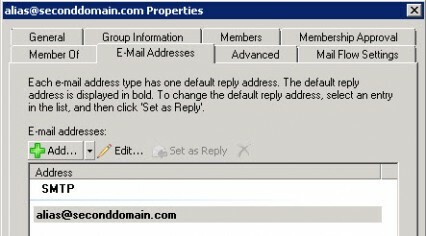 Create a dummy pop account in outlook and configure the alias as email address. There are some third party tools available that create a workaround. First we start with removing the alias we want to send as from the original mailbox. Now we create a new mailbox, give it a logical name, etc. and give the alias as email address. Now you are able to send as user@domain.com also with the alias@seconddomain.com address. We do this by using the From… field in outlook, add the alias in the from field when you want to send from the alias. When you don’t see the from field go to the options menu and choose Show From. Best thing to do is click the From… button and select the alias mailbox from the address list. 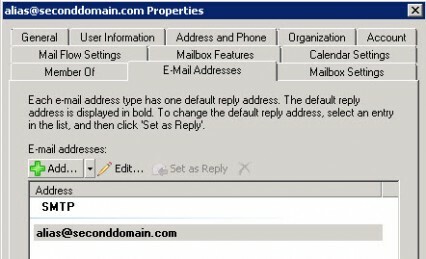 Of course when email is send to the alias@seconddomain.com it now will be delivered to this newly created mailbox. If you would like to receive the email just as before in the same mailbox (user@domain.com), then go to the properties of the newly created alias mailbox and choose the Mail Flow Settings tab, select Delivery Options… and choose properties. Add the original mailbox at the Forward to: field, via the Browse… button. Now all mail is forwarded to your original mailbox and all mail will be in same mailbox as before removing the alias. Now we create a new distribution group, give it a logical name, I always give it the name of the email alias and set the alias as email address. Then we add the original mailbox as only member. Now we need to set the Send As permissions for the original mailbox (user@domain.com) on the newly created distribution list. This cannot be done via the exchange management console, we have to use the exchange management shell. Best thing to do is click the From… button and select the alias distribution group from the address list. WARNING: This option is the least recommended, because setting up this will create the posibillity to open a security hole for smtp virusses. With this workaround we leave the email aliases as they are on the mailbox. 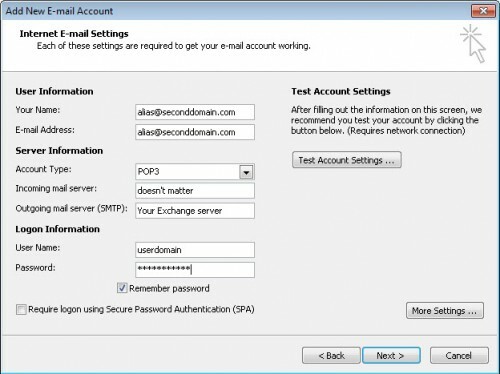 We are going to configure a dummy / fake pop account in outlook, so no server configuration needed. Open outlook and go to Account Settings, choose for New…, choose the email services that include Pop3, choose for manual configure server settings and choose Internet E-mail (Pop). At Your Name: we give your name (this is the name the receiver will see), at E-mail Address we give alias@seconddomain.com, at incoming mail server, just give in something it doesn’t matter, at outgoing mail server give in your Exchange server and at username and password give in your logon credentials (the users domain account credentials). 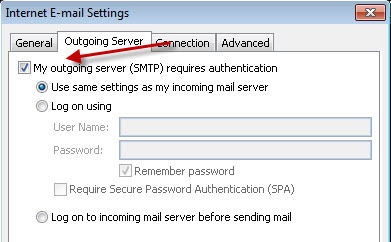 Make sure that you enable “My outgoing server (SMTP) requires authentication” on the Outgoing Server tab. This is needed to let you send via your exchange server, then finish the wizard. We do this by using the Account button that is created after creating the dummy pop account. You just choose the email address you would like to send your email from. So you see there are a couple of workarounds available, which one is the best, there isn’t it all depends on your needs and wishes. 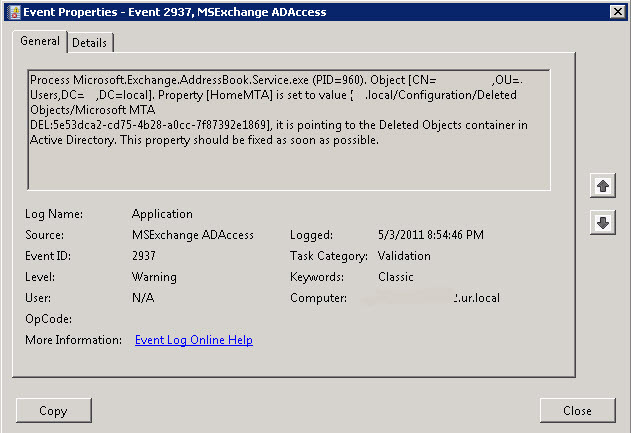 Posted in Blog, Exchange 2007, Exchange 2010, Howto, Outlook, SBS 2008, SBS 2011 at May 30th, 2011. 43 Comments. Watson report about to be sent for process id: 1240, with parameters: E12, c-RTL-AMD64, 14.01.0270.001, edgetransport, mscorlib, S.I.__Error.WinIOError, System.TypeInitializationException, c11a, 02.00.50727.4959.
edgetransport (1240) Transport Mail Database: The database engine (14.01.0270.0001) is starting a new instance (0). edgetransport (1240) Transport Mail Database: The database engine is initiating recovery steps. A configuration update for Microsoft.Exchange.Transport.TransportServerConfiguration has successfully completed. A configuration update for Microsoft.Exchange.Transport.RemoteDomainTable has successfully completed. A configuration update for Microsoft.Exchange.Transport.X400AuthoritativeDomainTable has successfully completed. 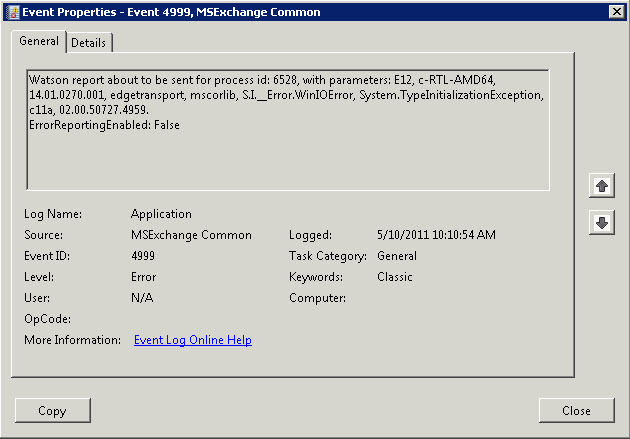 A configuration update for Microsoft.Exchange.Transport.AcceptedDomainTable has successfully completed. A configuration update for Microsoft.Exchange.Transport.ReceiveConnectorConfiguration has successfully completed. A configuration update for Microsoft.Exchange.Transport.TransportSettingsConfiguration has successfully completed. edgetransport (1240) Transport Mail Database: The database engine has begun replaying logfile C:\Program Files\Microsoft\Exchange Server\V14\TransportRoles\data\Queue\trn.log. edgetransport (1240) Transport Mail Database: The database engine has successfully completed recovery steps. edgetransport (1240) IP Filtering Database: The database engine (14.01.0270.0001) is starting a new instance (1). edgetransport (1240) IP Filtering Database: The database engine is initiating recovery steps. edgetransport (1240) IP Filtering Database: The database engine has begun replaying logfile C:\Program Files\Microsoft\Exchange Server\V14\TransportRoles\data\IpFilter\trn.log. edgetransport (1240) IP Filtering Database: The database engine has successfully completed recovery steps. And after that the edgetransport crashes again and the loop continues every 30 to 60 seconds. 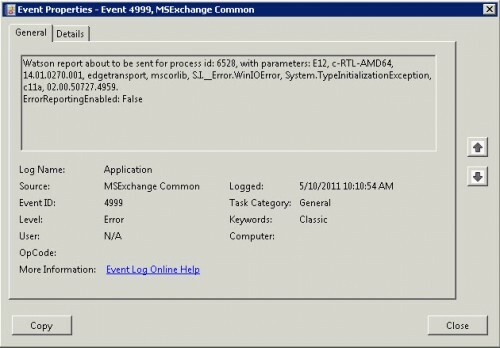 Upgrading Exchange 2010 to SP1 and later rollup 2 didn’t resolve anything. Do a Get-TransportAgent it gives a list of all transport agents, you will see which additional programs have plugged into the sequense. Restart the Microsoft Exchange Transport service. View the eventlog to see if the error returns , in my case the transport services was stable now (wait some time to be sure it won’t return it could take about 5 till 10 minutes till it cames back). Allright after you have seen everything is stable now we can enable the transport agents one by one to see when it will crash again. Use Enable-TransportAgent -Identity “transportagent name” (you can copy the exact name from the Get-TransportAgent list you did before) note some programs have more than one transport agent enable those together. After enabling a transport agent you have to restart the Microsoft Exchange Transport service again and see if the process keeps to be stable (Keep in mind to give it some time). If you have found the problematic transport agent you can use Disable-TransportAgent -identity “transportagentname” to disable on this transport agent again. In my case I have removed the problematic software and downloaded the latest version of the product and installed it the problem haven’t come back. Posted in Blog, Exchange 2010 at May 13th, 2011. No Comments. 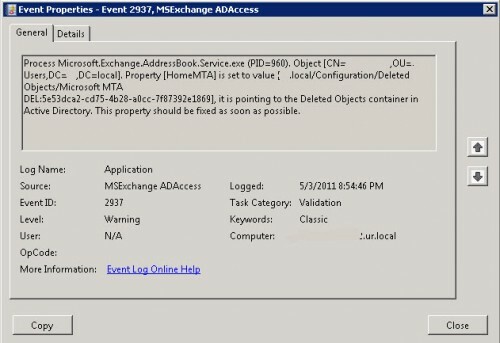 The last days I have seen many people who are reporting they get an error message when they try to close the Exchange 2010 Management Console: “You must close all dialog boxes before you can close Exchange Management Console”. Some research found there are many people with the same issue and that it all started after the installation of IE9. Because there is no solution yet, simply removing IE9 will help for now. Update: Finally there has been posted a resolution by the Exchange team for fixing this problem. First step would be installing the MS11-081 (2586448) cumulative IE security update. Second install KB 2624899, this is a hotfix only available for this issue and should be requested by microsoft support. Update 2: The KB 2624899 could be downloaded direct from this link here. Posted in Blog, Exchange 2010, SBS 2011 at May 9th, 2011. 4 Comments. Should you install Windows server 2008 R2 SP1 on a SBS 2011 server? This is a question I see a lot and today the SBS team clarified there statement that you should install windows server 2008 R2 SP1 on your SBS 2011 server. “We have been receiving a few questions on whether or not Windows Server 2008 R2 SP1 can be installed on SBS 2011 and wanted to provide the definitive answer on this blog. Yes, it can and should be installed on SBS 2011 Standard. Please note that SBS 2011 Essentials already has SP1 installed out of the box. A good rule of thumb is that if the patch or service pack is offered to your SBS server on Windows Update, it is supported to be installed on SBS. The SBS SE team reviews patches and service packs before they are offered to SBS servers. If you download the service pack manually you may notice that it is listed as Windows Small Business Server 2011 Service Pack 1. This is normal. Windows Small Business Server 2011 Service Pack 1 == Windows Server 2008 R2 Service Pack 1. Posted in Blog, SBS 2011 at May 5th, 2011. No Comments.